In case of an increased load, the tire's contact with the ground widens, resulting in short braking distances and excellent cornering stability. By linking together certain elements, the tire achieves steering precision and optimum traction for fun driving. 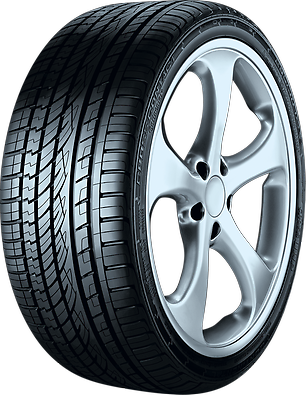 A special compound used within the tire ensures excellent grip and low rolling resistance. The German Magazine OFF ROAD has published in the recent issue 4/2016 their 4x4 Summer Tire Test. The tested tire size was 215/65 R16, test vehicle a Audi Q3. In issue 3/2014, Gute Fahrt (D) has published the SUV Summer Tire Test 2014. The tire size was 235/55 R17, test vehicle a VW Tiguan. Rating for the CrossContactTM UHP: "very good - (Testwinner)"
The Automotive Clubs ADAC (D) / OEAMTC (AT) / TCS (CH) have published the Summer Tire Test 2012 on their homepages (www.adac.de / www.oeamtc.at / www.tcs.ch). Test size was 215/65 R16 H.
Auto Zeitung (issue 15/2011) has published the SUV-Summer tire test 2011. The ContiCrossContact UHP again achieved the best result "test winner". Test dimension was 235/60 R18 W on a Audi Q5. In the current issue (Oct. 21), AutoExpress (UK) published the results of its SUV tires test. Test size was 235/55 R17 H/V/W. Test vehicle was a Toyota RAV4. Overall rating for the ContiCrossContact™ UHP: "Rank 2"
"Never we had a tire test that has been so close. Any of the top three will do an excellent job on your car, and drivers can confidently choose a tire based on individual strength in the knowledge that they are solid all-round performers."